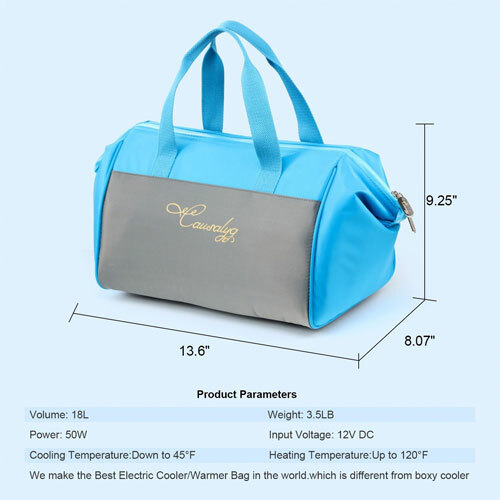 Want a soft-sided cooler that you can also plug into your car to keep cool? Look no further, because I’ve found the perfect cooler tote bag! The Causalyg may look like your average handbag, but don’t be deceived. This bag provides multiple functions and is more powerful than it looks. First of all, this insulated soft cooler also plugs into your vehicle’s cigarette/12V outlet. 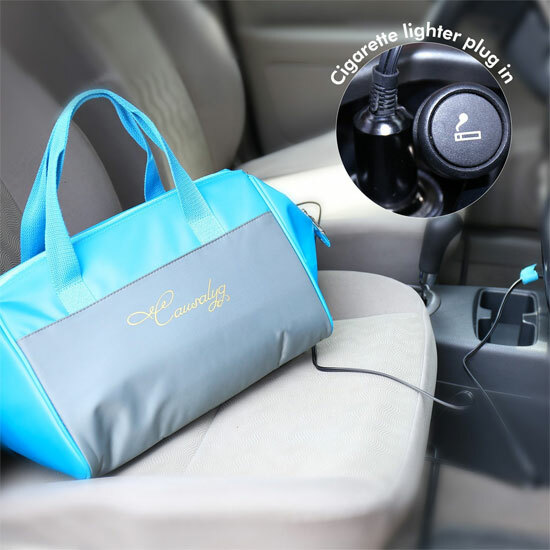 The added thermoelectric power gives it extra cooling ability while you are driving on road trips, commutes, etc..
For example, the insulated liner in the bag keeps the interior contents cool or warm for about 4 hours. (No need for ice either!) By adding extra thermoelectric power, you can easily extend the cooling/heating time by many hours. The electric power works very efficiently. Plus, the specially-designed zipper locks in the heat to make the bag even more cost-effective. 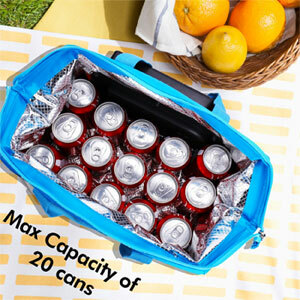 Third, this 18-liter carrier can hold up to 20 soda/beer cans. That’s a good-sized capacity for a bag that doesn’t take up a lot of space and is also comfortable to carry. Due to the fact that the sides of this cooler are flexible, you can carry tall wine bottles or larger containers as well as smaller items. On the other hand, you can easily keep a case of beer cold for hours simply by sticking it in the bag! Fourth, the power cord measure 74″ (over 6 feet!). You can easily plug the unit into the front of your car while you keep the cooler in the back. I find this feature ultra convenient. 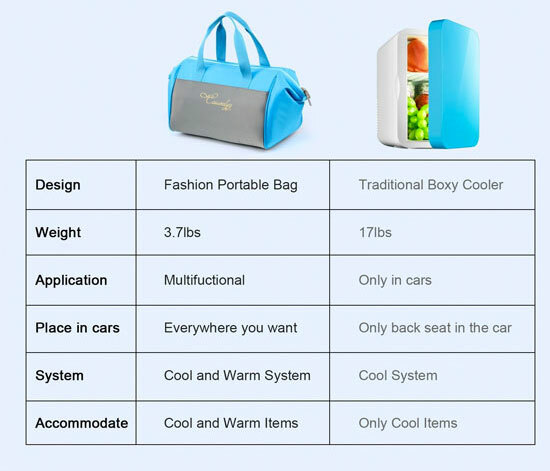 Fifth, cooler tote bags weigh less than traditional hard-sided coolers of the same capacity. Therefore, this bag is easier and more convenient to carry. This factor alone makes people want to use it more often,… as you’d expect. In addition, the anti-skid design on the bottom of the cooler helps it stay in place while you are driving. This comes in really handy when you have the bag in the back of your car, on the seat o f a moving boat, etc..
Packit Freezable Grocery Bag – Is this Cooler Worth $25?